Hanoi (VNA) – A host of traditional festivals have kicked off in different provinces on February 13 – the sixth day of the Lunar New Year. In the northern province of Ninh Binh, the Bai Dinh Pagoda Festival began in Gia Vien district in the presence of thousands of Buddhist followers and visitors. 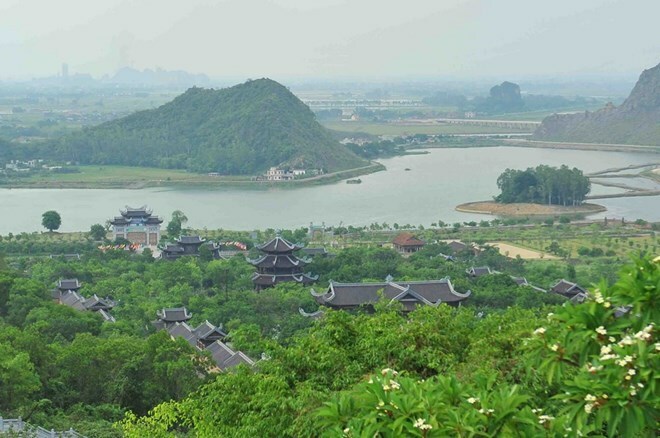 Ninh Binh is home to a number of relics attached to the development of Buddhism in Vietnam, including Bai Dinh Pagoda, built in the late 10th century, where an array of significant historical events took place, said Secretary of the provincial Party Committee Nguyen Thi Thanh. Deputy Prime Minister Nguyen Xuan Phuc and Finance Minister Dinh Tien Dung beat the ceremonial drum and gong to open the festival, which will last through the third lunar month. Bai Dinh Pagoda is part of the Trang An Landscape Complex – a world cultural and natural heritage site recognised by UNESCO. The pagoda itself is a complex of the original and newly built Buddhist temples on Bai Dinh Mountain, nearly 200 metres above sea level. The recent additions are considered the largest Buddhist temples complex in Vietnam and currently hold several national record-setting relics. Meanwhile, the festival of Nem Thuong village in northern Bac Ninh province also took place with the highlight being a pig sacrifice ceremony. Unlike the traditional practice carried out at the local communal house in front of the public, the sacrifice ritual this year was held in a separate area. The festival also features various activities such as Quan ho singing on boats and folk games like wrestling, tug-of-war and cockfighting. Dating back more than eight centuries, it was resumed in 1999 and is organised on the fifth and sixth days of the first lunar month. The pig sacrifice ceremony reproduces the slaughter of wild pigs for soldiers to feast on by General Ly Doan Thuong in the Ly Dynasty (1010 – 1225). It aims to honour the General’s devotion, remind the later generations about ancestors’ heroic tradition, and pray for prosperity. Also on February 13, thousands of people flocked to Chuong Market in Dong Son district, the central province of Thanh Hoa, to throw farm produce into one another to wish for good luck. The legend has it that in ancient times, the troops led by a general was surrounded by foreign invaders when they came to this area on the sixth day of the first lunar month. The general asked local residents to hide weapons and do buying and selling activities in the market as usual. As the invaders were fooled and off their guard, locals used hidden weapons and other objects to attack and throw into the enemy. At Chuong Market on this day, visitors and local residents buy farm produce such as tomatoes, apples or eggs to throw into one another, which means throwing bad luck away and wishing for good fortune in the New Year.